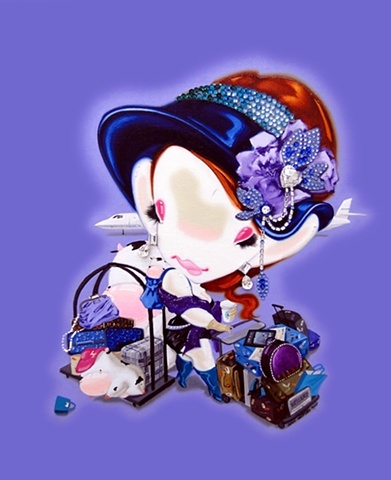 "Jet-Setter" is a stunning example of the mixed-media paintings of female Chinese Contemporary artist Han Yajuan, with a single female character whose features are so highly exaggerated that she becomes a type of metaphor, shown here just off of her private jet painted behind her in the distance, surrounded by all the trappings of her wealth and status. The great attention to detail as well as the mixed media approach to the figures and objects that occupy Han's paintings underscores why her work is ground-breaking and meant to read as highly ironic commentaries on the socio-economic conditions in China and the world in general. This young woman is also independent, and needs no man to accompany her or support her financially, a comment on changing gender roles in China. This young woman nonchalantly holds a Starbucks coffee cup, with her travel cart piled high with many "necessary objects". Her wealth is such that she is unaware that her very expensive Hermes hand-bag that has fallen off of her trolley behind her, in her case an object easily replaceable. She is fully made-up and dons an elegant outfit, replete with a smart hat, detailed in colored Swarovski crystals, and large faux-gemstones suggesting large diamonds, that all intentionally push this work into the realm of surreal excess. Han Yajun has firmly established herself as of the hottest Chinese Contemporary artists of her 80's generation internationally, known for her compositions that underscore the possession and longing for material wealth, international travel and to be a part of the wider, global community. This desire for material indulgence and mass consumerism by the younger women in China, as well as the growing uber-wealthy class in China, is the foundation for her series of mixed-media oil paintings. Han was born in 1980 and received her training with a B.F.A. in 2002 from the China Academy Of Art, Hangzhou, China. In 2004-05 she taught at the College of Visual Arts, China Academy Of Art and in 2008 received an M.F.A Degree from the Oil Painting Department, Central Academy of Fine Art, Beijing. Her work is globally acclaimed with representation at the top U.S., European and Asian galleries. Her most recent solo exhibitions was "Indulgence and Transcendence ", in 2011 at Eli Klein Fine Art, New York and in 2009, "Bling Bling" at Chinese Contemporary, New York, as well as "Angels from Hell", in 2008 at Olyvia Oriental, London, UK. She has had additional solo shows at Tokyo gallery, Tokyo, Japan; Willem Kerseboom Gallery, Amsterdam, The Netherlands; PROJECT B Contemporary Art, Milan, Italy as well as shows in Beijing and, Hong Kong. Selected group Exhibitions include her important inclusion in 2011 in "Future Pass", Abbazia Di San Gregorio, Venice, Italy and in "Surrealist Pop", Injoy Museum of Art, Beijing, China as well as "Half of The Sky: Women in the New Art of China", Leonard Pearlstein Gallery, Philadelphia. 2010 saw the work of Han featured in prestigious Museum exhibitions including "Animamix Biennale", Shanghai MoCA Museum, Shanghai, China and "Invisible Wings", Times Art Museum, Beijing, China. From 2008 though the early 2000's the artist was exhibited world-wide, in the USA, U.K., Brazil, China, Korea, Italy, France, Spain, United Arab Emirates and New Zealand. She presently lives and works in China.